Introduced in Mighty Grocery v3.1. Meal Planner helps you manage meals for upcoming weeks and plan ingredients to buy. 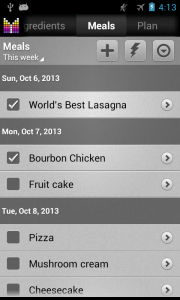 Tap Plus button or date record to add recipes. 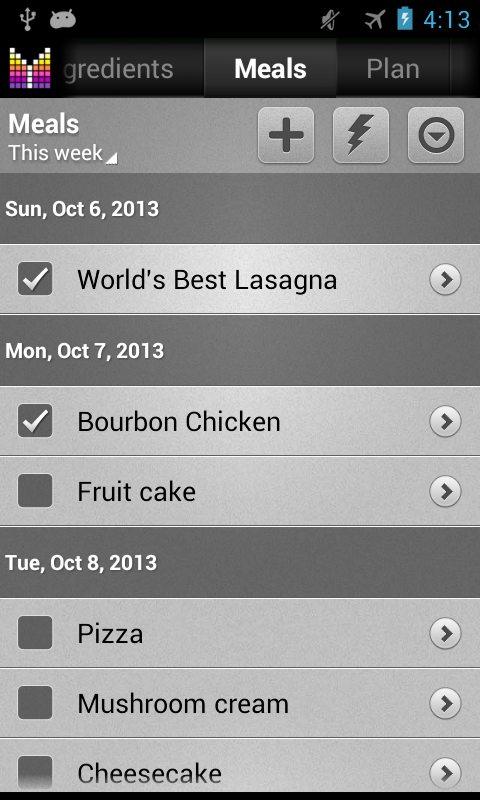 Switch to Edit mode (lightning button) to quickly delete recipes, change order of meals, or change meal’s date. To copy meals from another week, tap Side Menu > Copy from > select week to copy meals from. Available meal filters: This week, Last week, Next week. Tap selector in the upper-left corner to choose week. Setting checkbox next to meal removes associated ingredients from Pantry. Go to Plan tab to see listing of ingredients required for meals for upcoming days. Tap Side Menu > Filter > Select days to set number of days to plan for. Select destination shopping list in the selector in the upper-left corner. Red – there is no enough ingredients for planned meals. Yellow – stock is more than needed for planned meals. Green – shopping list(s) contains just enough for planned meals. I do all of the shopping and cooking at our house and am just learning to use this app. I must say so far I Love It. Just wondering if there is any way under meal planner – recipes – to add simple categories – such as maybe meats, vegetables, starches, sides, etc. It just seems like as I continue to add recipes that it would be quicker searching rather than having to scroll thru my whole list. I love trying new recipes, so I am adding a lot. Thanks for your consideration. Robert, thanks for your feedback! We are planning to improve recipe search going forward. We will consider recipe categories going forward. Hi, I love this app but sometimes it is complicated to use… Why in meal planner you can enter only recipes? Do not it be better if you can add even individual ingredients in order to be able to organize all weekly shop? Stefania, thanks for your feedback. We are working to make the app easier to use in the future. In the meantime you may want to try creating temporary Ad-hoc recipes to keep your individual ingredients. Under Meals tab > Plus > select date(s) > New recipe > enter name > Save. The new Ad-hoc recipe won’t be listed under Recipes tab unless you tap “Make permanent” in its properties. Hopefully this helps. I make meals for several weeks at one time then put in freezer. Some items needed are perishable so I don’t want to buy them in advance. Is there a way to have an item added to the shopping list for a future date? Carrie, unfortunately it is not possible to add items for a future date, but you could make use of consumption rate feature in Pantry. Just create an item in Pantry and set Target Qty – the amount of item you’d like to have in stock. Set date of last purchase and consumption rate — the amount of item consumed on average daily. You can also set Reorder Qty, a threshold used to indicate that item is needed. Now when the item is needed it will be listed under “Plan” tab. For instance if you’d like to see Apples in purchase plan in 5 days, set target qty to 10lb, purchase date to today, consumption rate to 2lb/day. In 5 days Apples will appear under Plan tab. Carrie, have you checked the Plan tab? It should aggregate amount of ingredients from all your meals and it should be possible to add total quantity to shopping list from there. And one more question, when fragments,?it’s a nightmare tha back button. Soyflex, thanks for your feedback. Unfortunately, Select all command is not available under Plans tab. We will consider adding it in the future. As for the other question, could you please provide more details? Thanks for the details. We plan to change navigation going forward. In the meantime you can quickly go to Home screen by tapping icon in the upper-left corner and switch between tabs by scrolling them on the top of the screen. I would love a way to export a menu to my calendar so I can share with my family. Thanks for the idea. We will consider it going forward. I would also like to see an export to calendar (hopefully Google calendar) option. I use the calendar in Google to add to my daily calendar to see all my appointments as well as what I was planning for dinner. For this feature, I would like an option that allows me to set the time (a default option would be nice) for each event. Thank you and I love the app! Mike, thanks for your feedback. We will consider ability to export Meal plan to Calendar in the future. Love the app. Would like to see the menu to be more accessible including the option of a widget, put on the home screen, and being able to organize recipes into groups such as breakfast, main meals, appetizers, etc.. Thanks! Michelle, thanks for your comment. We may consider adding these features going forward. Would like breakfast, lunch, dinner groups under the..
Hi Camille, thank you for your suggestion. We will consider adding meal groups going forward. Please let me know if you have any further questions or comments. Hi, love the app, first app I paid for years ago. Trying to start using the meal planner and pantry. I can’t seem to get them to sync to the cloud. Reading through the other pages I have discovered that recipes don’t sync, I’m assuming that neither do meals or the pantry. Any idea when this will be implemented? Setting up meals plans and recipes is useless if I can’t sync it with my wife’s phone. I really want to keep everything in mighty grocery, but without sync meal planning I have to look elsewhere for meal planning. Martin, unfortunately Recipes and Meal Planner cannot be sync’d at the moment, but we have plans to add this feature soon. In the meantime you may want to create backups on primary phone and restore backup on secondary phone to transfer Recipes and Meal Planner data. Sorry, but I couldn’t find “week starts on…” option anywhere in settings. My phone settings are set to U.S., but I live in Europe, where Monday is considered to be the 1st day of a week. Week starting with Sunday is something not very convenient for me in Planner. Andrey, thanks for your feedback. Unfortunately, there is no such option. The app uses week start from your locale settings. We may consider adding week start option going forward.